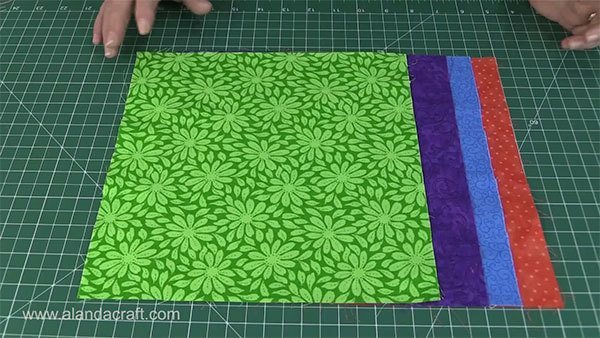 This is such a fun, easy quilt to make and it uses the stack n slash quilt technique to create the blocks. The quilt was made with 20 x 10″ squares of fabric. 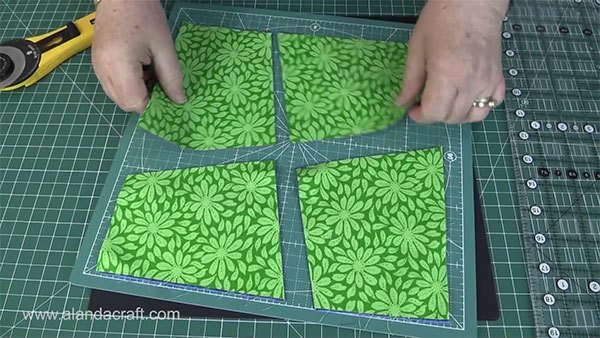 You can cut 10″ squares from fabric you have on hand or you can make it from a Layer Cake. You do need to make sure that you put together 4 different coloured fabrics in each block. The quilt measures 46″ x 54.5″. You can make it larger just by adding more blocks. You could also change the size of the actual block itself. Just scroll to the bottom of this post to see the calculations for different block sizes. 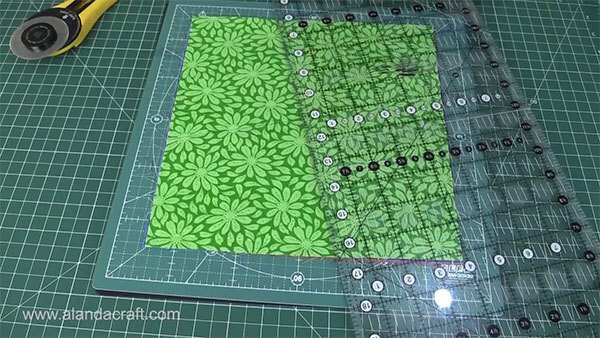 Take your rotary cutter and ruler and slice across the squares. NOTE: Don’t make the angle too sharp and don’t cut on the diagonal from point to point. We don’t want triangles. Now cut across the squares from the other directions. This is the SLASH part of the Stack and Slash process. You will end up with your squares cut into 4 pieces. I like to work with one block set at a time, and I take it through from cutting to adding the bias tape, then I work on the next set of blocks. But if you are super organised you could cut all your blocks and make sure you define them in some way with letters and numbers so they don’t get mixed up. I’m not organised enough to do that. So I just stick to my method – it works for me. This is how your blocks will look once you have laid out the pieces. Check the video for an easy way on how to lay out the pieces so that you don’t get lost with this part (believe me it is easy to do). Take the top two pieces of the block and lay them right sides together. Sew the bottom two pieces of the block and lay them right sides together. Place the top two pieces on top of the bottom two pieces. Make sure you line up the centre seam lines. The edges may be slightly out, and that’s ok, we will be trimming. Just make sure those centre seams line up nicely. 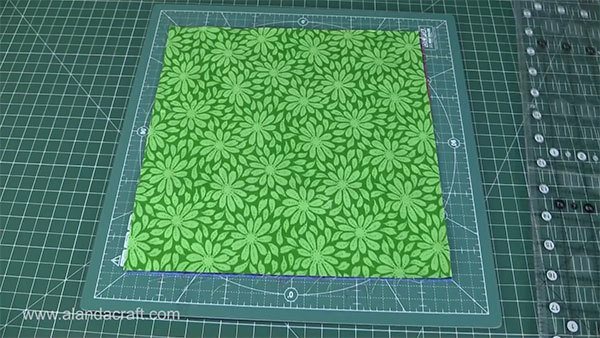 Cut a piece of Clover Bias Tape and remove the paper backing. Lay it across the seam line. Sew the tape down each side or you can use a twin needle if you have one. Cut a piece of bias tape and lay it across the other seam line and press it in place. Again sew the tape down each side or you can use a twin needle if you have one. Do this for all 20 blocks. Trim the blocks to 9″. You can check the video to see how to do this. Lay the blocks out and arrange them in the manner you like. Sew the blocks into rows. I usually sew the first two blocks together and the last two blocks together, then sew the four blocks into a row. Do this for all 5 rows. Once all the blocks have been sewn into rows, it’s time to join the rows together. Place the top row on top of the next row, right sides together, and sew with a ¼” seam. Again I generally sew the rows in lots of two and then sew them all together. Once all the rows have been sewn together, it’s time to add the bias tape. 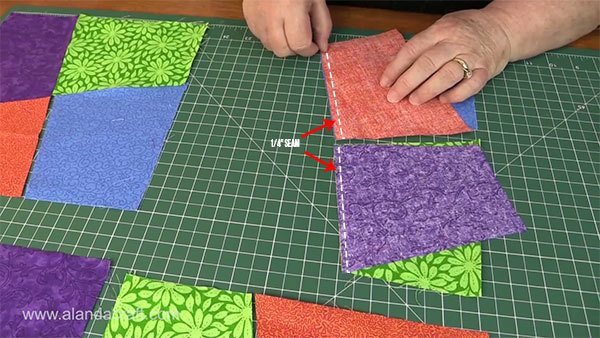 Lay one long piece of tape along the seam line of each of the rows running horizontally across the quilt. Do not apply the tape to the top or bottom rows. Iron these bias strips and sew in place. Now lay one long piece of tape along the seam line of each of the rows running the vertical length of the quilt. Do not apply the tape to the outside edge seams. Iron the bias strips and sew in place. Cut side border strips 43 x 2½” wide. Cut top and bottom side border strips 38½” x 2½” wide. Attach to quilt with a ¼” seam. Cut a piece of adhesive bias tape slightly wider than the quilt. 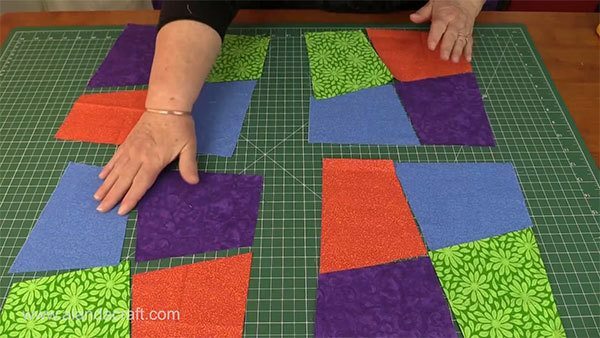 Attach the tape so that it lays along the top of the seam and cut another piece to lay along the bottom seam where the borders join the quilt but extending it over the border to create a stain glass square. Do the same for the pieces going down the length of the quilt. Quilt as you wish and add binding. 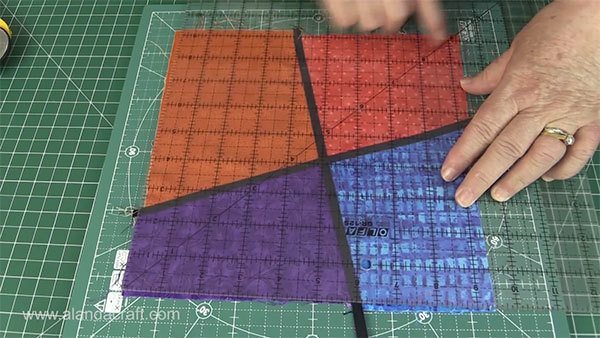 To work our how much binding you will need, here is a link to our ‘How to Calculate Your Quilt Binding‘ tutorial. We had our quilt, quilted by Chris from Sew ‘n’ Sew Sisters here in Australia. 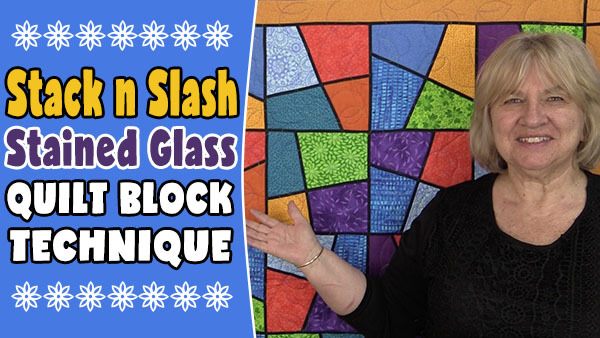 If you would like to make your Stack and Slash quilt blocks a different size then you will need to start with a fabric square size that is 1″ bigger than your unfinished quilt block size which would be 1 ½” bigger than your finished block size. 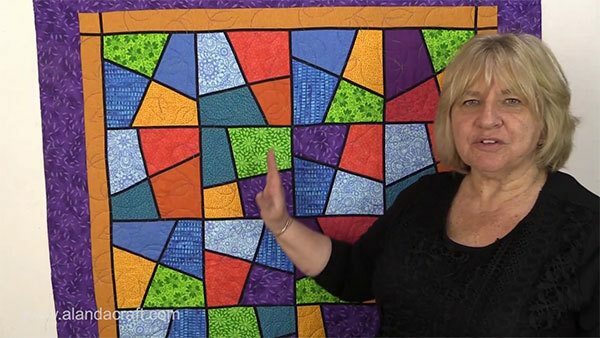 I watched your stained glass quilt tutorial and have a couple of questions. 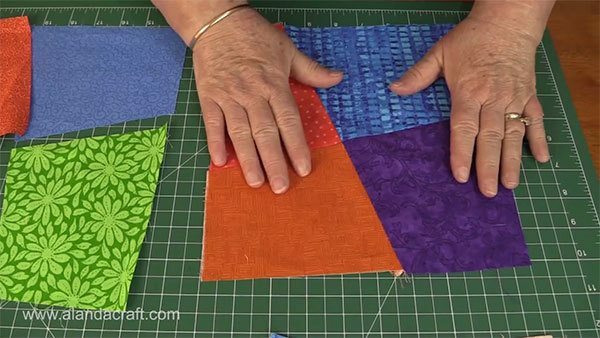 First, I am new to quilting and I mentioned using bias tape to my friends and they all said don’t use it, that it’s hard to work with – very stretchy. I don’t know. And also how did you quilt it without going over the bias tape or did you just quilt right over it. It’s hard to tell. The bias tape we use isn’t particularly stretchy. It’s thin and has an adhesive back so it makes it really easy to use. When it came to quilting, we got this one professionally done. The stitches did go over the bias tape at various points. How can I get a written copy of the stained glass stack and slash? I’m sorry Nancy, we don’t have downloadable pdf files for our tutorials. The only thing I can suggest is that you select and print the screen.